2014 Toyota Sequoia SR5 4WD. The only option it has is the Premium Package, which has heated power leather seats, navigation. It's a large body-on-frame SUV with seating for 8 (SR5 and Limited models; Platinum has 7 cause it has a center-console in the 2nd row). The 2007-2013 Tundra and Sequoia are very similar inside and out and share a lot of components. 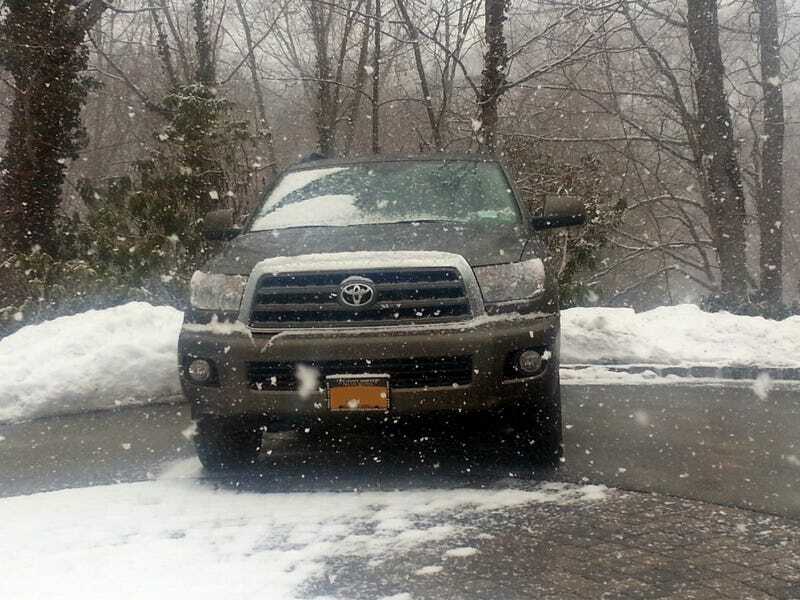 Not sure if Toyota is continuing the Sequoia after 2014 or is making a new one based on the redesigned 2014 Tundra. It looks a bit weird. I don't dislike it, but I don't think I like it very much. The big grille is aggressive but those headlights are typical Toyota. I do like how it looks from the side and rear. There aren't many good looking SUVs/crossovers on the market today IMO, but then again, my idea of a good looking truck is a last-gen Ford Bronco. Visibility is good overall and there aren't any blindspots. The side mirrors are *huge* and help out a lot. Mine's a bit dirty at the moment, but the brown paint (Pyrite Mica) looks very nice when it is clean. This is one area where the truck shines, though it does have a few flaws. The instrumentation is easy to read at night and clear. The buttons make sense, though there's a lot of them. The steering wheel controls work fine but the audio controls are opposite of what they should be... up and down to change tracks... instead of left and right. The cruise control, wiper and lighting stalks are the same ones Toyota uses in many of their other vehicles. As with everything with this car, the dashboard is ENORMOUS. The center console itself is huge and it's pretty evident that it is a middle seat in Tundras with front bench seats. The driver and front passenger are in separate zip codes. The shifter is in a nice position and the handle is tall so that you can rest your right arm on the console and your hand on the knob while driving with your left hand. The radio and navigation buttons are a bit far and smaller drivers (like me, I'm 5'5") will have to stretch to use them. But most of the audio functions can be controlled via the steering wheel. One of my favorite features is the rear window can be opened/closed with a button. The layout didn't take much getting used to for me compared to some other interior layouts... I'm still trying to get used to the Fusion's Sync system and button layout nearly a year later. The leather seats are high quality leather and soft to touch. They're very comfortable on long drives, more on that on the ride section. There are some ergonomical issues with the button layout but a lot of other Toyota vehicles suffer from the same issue. One of the biggest (get it? tee hee) reasons my family got this is cause it has a LOT of interior space. Not that I need the 3rd row but I've already moved someone into a new place with their box spring, mattress, table, and clothes in one go. Will also be handy for woodworking projects. The legroom in the 2nd row equals that of fullsize luxury cars... and even the 3rd row legroom is decent. You can fit 3 adults in the 3rd row comfortably, something not many large SUVs other than the Suburban and its variants can do. There are TONS of storage containers scattered throughout the cabin as well as plenty of cupholders. The 3rd row is power folding/reclining and each seat in the 2nd row can be folded individually. All 2nd and 3rd row seats fold flat. You can manually recline the 2nd row seats too. Lots of airbags for safety. The engine is smooth and acceleration is quite brisk. 0-60 is around 6.5 seconds. Passing is effortless and the truck feels stable at 80. The 6 speed automatic is fine and it doesn't mess around looking for gears. Shifts are smooth. I'm getting 13-15 mpg city and 17-18 highway. Last weekend I drove nearly 700 miles and averaged 17.9 mpg. It handles how you'd expect for a large truck-based SUV. You won't be zipping through small spaces nor will you be cutting corners but it'll turn for you. The steering is predictable and light... if not, a bit too light at times. The turning radius is better than you'd expect but still be prepared to make more manuevers than you would in a... Honda Accord or something. It has 3 settings: 2WD, 4-Hi, and 4-Lo, all controlled by a knob. You can engage the center differential lock in 4-hi and lo. It snowed 14" a couple weeks ago and it went through it like it was nothing. The tires are Bridgestone Dueler all terrains, similar to the ones I had on the 2011 Wrangler the Seq replaced. Towing capacity is just over 7,000 pounds. I'd dare even say it is as comfortable as a luxury car. The seats are good and supportive on long drives, the ride is controlled. You only remember its truck-based roots (comfort wise), when you drive on uneven, rough, or unpaved surfaces. Plenty of space and legroom for all 8 passengers. They work quite well for something of this size. It requires 127 feet to stop from 60mph. The brake feel is a bit vague. The Entune system is considerably better than previous Toyota audio systems (My sister has a 2010 Prius and the iPod menu is complete crap). The sound quality is very good too. It has satellite radio, many AM/FM presets, CD, and AUX/USB ports. The engine is quiet and reserved but once you get it past 3,000 RPM it comes roaring to life with a mighty sound that only a large V8 can emit. There's plenty to do in here. The 3rd row seats are power folding/reclining which is pretty cool. The 2nd row has manually adjustable recline and there is 3 zone climate control: driver, passenger, 2nd and 3rd rows. There is a "mommy mirror" on the overheard console that lets you keep an eye whats going on in the backseats. USB/AUX/iPod/mp3 player support, power rear window, sunroof. A couple things that I wish it had (but are standard on the Platinum) is a built-in inverter and heated rear seats. Minor complaints. The Entune system has navigation, smartphone app support (things like Yelp, Facebook Places, etc.) satellite radio, and bluetooth support. I like it a lot so far, it's been about a month and a half. It drives nice, certainly isn't sporty but it is quick and has lots of torque. It can be hard to park in smaller spaces but that's expected. The interior is pretty nice and roomy. Rides comfortably. Well-equipped too.